PYEONGCHANG -- The 2018 PyeongChang Paralympic Winter Games came to a close on Sunday with a celebration of disabled athletes who broke down barriers during the 10-day competition. The quadrennial event wrapped up with the host South Korea having grabbed its first-ever gold medal -- won by para Nordic skier Sin Eui-hyun in the men's 7.5-kilometer sitting cross-country skiing -- and finished 16th overall with a gold and two bronze medals. PyeongChang, some 180 kilometers east of Seoul, along with the sub-host cities of Gangneung and Jeongseon, hosted 567 athletes from 49 countries -- both records for Winter Paralympics. The athletes vied for 80 gold medals, also a record for the multi-winter sport event for the disabled. 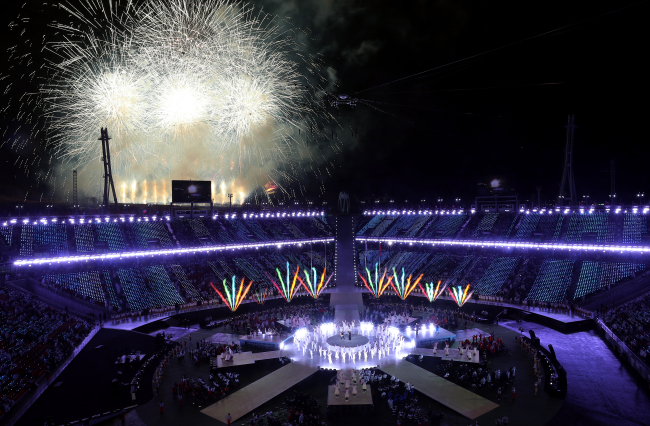 The closing ceremony at PyeongChang Olympic Stadium, titled "We Move the World," brought para athletes together for one last time in PyeongChang. The ceremony also featured performers with physical impairments for its art segments, which expressed hope for a world that embraces diversity and differences among people. At the onset of the ceremony, six South Korean para athletes, each representing six sports of the Paralympics, carried their national flag into the stadium. They were Jang Dong-shin in para ice hockey, Bang Min-ja in wheelchair curling, Lee Chi-won in alpine skiing, Park Hang-seung in snowboarding, Lee Do-yeon in biathlon and Lee Jeong-min in cross-country skiing. Then as the participating countries' flags all entered the stadium, Sin Eui-hyun, the cross-country champion for South Korea, served as the flagbearer for the host nation. Before winning his gold medal, Sin also won bronze in the 15km sitting cross-country event. He was responsible for two of South Korea's three medals here, the one other being the para ice hockey team's bronze medal. During the ceremony, New Zealand's para alpine skier Adam Hall and Finland's para Nordic skier Sini Pyy were honored with the Whang Youn Dai Achievement Award. Established by the International Paralympic Committee at the 1988 Seoul Summer Paralympics, the award is named after the South Korean female doctor with an impairment who advocated for people with disabilities for more than 50 years. It has since been presented to one male and one female athlete who best exemplified the Paralympic values at the end of each Paralympics. The Paralympic flag was handed over to Beijing, the next host of the Winter Paralympics in 2022. Then the Paralympic Flame was extinguished at the end of a dance performance called "Dosalpuri," a dance of affections and memories, on the stage on which the flame was projection-mapped. For the finale, a segment titled "Blooming Happiness," South Korean vocalist Ailee performed with Bae Hui Gwan Band, which is made up of musicians with disabilities. The PyeongChang Paralympics were the most successful Winter Paralympics in terms of ticket sales, with more than 343,000 tickets sold. The previous record had been 316,200 tickets sold at the 2014 Sochi Winter Paralympics. The United States topped the Winter Paralympic Games for the first time since Albertville 1992 thanks to 13 gold, 15 silver and eight bronze medals. The Neutral Paralympic Athletes from Russia was second with eight gold, 10 silver and six bronze medals. The Russians were not allowed to compete under their national flag due to a state-sponsored doping scandal. Of the 49 competing delegations, 26 won a medal, beating the record set at the Lillehammer 1994 Paralympic Winter Games. A record 20 countries won gold, three more than the previous mark set in 1998 and matched in 2002. North Korea, one of three countries making a Winter Paralympics debut here, had two cross-country skiers in action, Ma Yu-chol and Kim Jong-hyon. They were granted last-minute entries by the IPC and didn't win any medals in PyeongChang. Unlike at the PyeongChang Olympics, the two Koreas didn't have a joint march at the Paralympics opening ceremony. They still shared a moment of harmony when the North's Ma and South's Choi Bo-gue carried the Paralympic torch together before the lighting of the cauldron.